Do I even need to form a separate legal entity? Some business owners operate their business without ever organizing a separate legal entity. These business owners may reserve a trade name or operate with a DBA (which stands for “doing business as…”), but they don’t form a separate legal entity to operate their business. These types of businesses are generally referred to as sole proprietorship (if there is one business person) or partnerships (if there are multiple partners in the business). For small businesses with very little risk, this may be an acceptable option that allows you to avoid unnecessary filing fees or attorney costs. However, this provides no asset protection to you or your business. By formally organizing a business entity, an investor/owner can create a separate entity to assume the risk of the business enterprise. The risks of the business can therefore be “insulated” so that the business’s creditors can only look to the business itself for payment. That way business investors know that any funds they have invested in the business are at risk, but if the business itself fails to meet any of its obligations, the investors can avoid being personally responsible for the liabilities of the business. What Entity Should I Use? Forming a legal entity is an important step in limiting your liability and protecting both your personal and business assets. However, not all entity types provide the same level of asset protection. While there are entire books written about the legal issues involved in making this choice, there are a few key issues that everyone should understand when deciding what type of entity to use for their business. Inside-Out Protection: protects business owners (shareholders, members, limited partners) from the liabilities of the business. (Most entity types provide this type of protection. Corporations were created by statute hundreds of years ago to provide Inside-Out Protection to investors or shareholders. The basic idea was that if shareholders could be assured that they would not be held personally responsible for the liabilities of a business, they will be more likely to invest their money. With these investments, companies could attract more investors and engage in business ventures that would be too uncertain or expensive for one person to pursue alone. While corporations provide great inside-out protection, they do not provide any outside-in protection. This is because a shareholder’s personal creditors can generally obtain a judgment against the shareholder and then take the shareholder’s shares in the business in order to satisfy a debt. With enough shares, the creditor (now a shareholder) can vote to dissolve or liquidate the business and take its share of the business assets. This is one of the reasons LLC’s have emerged as the entity of choice for many new business owners. LLCs generally provide both inside out and outside-in protection. In several states, including Arizona and Nevada, state law limits the creditors of an LLC’s owners to what is known as a “charging order.” This means that if a creditor obtains a judgment against a member of an LLC, that creditor has the right to receive funds as they are distributed from the LLC to its members, but does NOT provide the creditor any opportunity to control the operations of the LLC or to force a liquidation of the LLC’s assets. A Special Note About Single-Member LLCs: Arizona and Nevada (along with several other states) have enacted statutes directing that a “charging order” is the sole remedy that a judgment creditor can use against the member of an LLC. In other states, with similar statutes, courts have distinguished between single-member LLC’s and multi-member LLC’s and have allowed judgment creditors to force the liquidation of an LLC that was owned by a single member. To date, no Arizona or Nevada court has made this determination, but most experts agree that a multi-member LLC is still a safer way to ensure outside-in protection, protecting the LLC assests from future creditors of its members. Limited Partnerships can also offer both types of asset protection to most of the members, but generally require that at least one partner (this partner is known as the “general partner”) to be liable for all of the liabilities of the business. Arizona and Nevada do now allow for limited liability partnerships (sometimes also referred to as Registered Limited-Liability Partnerships) in which even the general partners(s) can also have limited liability. Ordinary Partnerships (which do not require any formal organization and can sometimes be created accidentally) do not provide any liability protection. All partners are fully liable for all of the liabilities of the underlying business. Accordingly, if you running a business together with other partners, you would be wise to meet with a qualified attorney to ensure that you are have not unknowingly created a general partnership that may subject you to unknown liabilities of your partner and/or your partner’s business decisions. Of course, there are other issues to consider as well when determining what type of entity to use for your business. For example, corporations and partnerships are treated very differently under the U.S. tax laws while an LLC can opt to be taxed as a partnership or a corporation. Additionally, each state has a different set of requirements for maintaining the proper status of a corporation vs an LLC vs a Limited Partnership. In Arizona, for example, corporations, must file an Annual Report each year, while LLCs only have to file documents when there has been a change in ownership structure. Owners should also consider their future funding sources or exit strategies. For example, many entrepreneurs who plan to attract venture capital or sell shares to the public will opt for a corporation instead of an LLC because many sophisticated business parties prefer working with corporations due to their long legal history and well-established case law. At the same time, some closely-held family businesses will opt for a family limited partnership structure as a part of an estate tax planning strategy. Many business owners mistakenly believe that once they have filed the necessary paperwork to form their businesses entity, their assets are protected. Unfortunately, this is not the case. Well-drafted organizational documents help to lay a secure foundation for any business, but throughout the life of the business, there are a number of “maintenance” steps that must be taken to ensure the business remains in good standing and that the assets of the business and the business owners remain adequately protected. As we’ve described above, business owners create separate business entities largely to insulate the risks and liabilities of the business and keep them within the entity. However, when the required formalities are not maintained, courts will sometimes make the determination that the business entity is not a completely separate entity, but is, instead, the “alter ego” of one or more of its owners. In these cases, the courts will “pierce the limited liability veil” (historically referred to as the “piercing the corporate veil” in corporations) by allowing the creditors of the business to obtain judgments against the owners. The best way to avoid piercing the limited liability veil is to observe all of the necessary business formalities. This generally includes preparing and following a formal set of rules (usually spelled out in the Bylaws of a corporation or the Operating Agreement of an LLC). Additionally, it is critical that the business maintains up to date records (such as Annual Reports, for corporations) that are timely filed with the appropriate state agency. It is also important to formally document the decisions of the business entity at company meetings and in company minutes. The company should also document agreements between the company and the company’s owners and employees in signed written contracts. Often when courts have determined it is appropriate to pierce the limited liability veil, it is because owners freely move funds between their personal bank account(s) and their business bank account(s) without proper documentation or they otherwise use business funds to pay their personal debts or obligations. Another way to avoid piercing the limited liability veil is to ensure that your company has adequate resources to meet its business needs. Courts do not look kindly on business entities that regularly generate profits, but do not maintain enough funds or insurance to pay for liabilities. Because it may not always be practical to keep sufficient cash on hand to cover potential liabilities, prudent businesses will buy insurance policies to meet these needs. Companies that are undercapitalized and uninsured are much more likely to be treated suspiciously by the courts and are likely to have their limited liability pierced. An often over-looked aspect of asset protection is reviewing and when necessary, re-negotiating old agreements. In the early stages of a business, entrepreneurs often co-sign loans with their start-up venture or otherwise agree to be personally liable for certain business debts and liabilities. While this is often a necessary step along the way to business success, once a business has established itself and has demonstrated an ability to generate a regular stream of income, some lenders and creditors may be willing to forego the usual personal guarantees.If you have been in business for some time and think you may still be personally liable for the debts or future liabilities of your business, it is always a good idea to review those agreements with a Mesa business attorney who can help you with your asset protection planning. 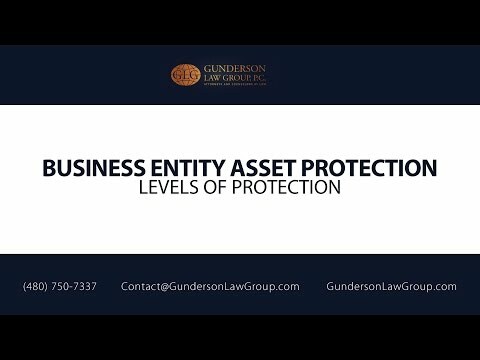 If you have specific questions or concerns about asset protection issues for you or your business, please contact the attorneys at the Gunderson Law Group, P.C. in Mesa, Arizona. We serve clients in Mesa, Phoenix, Tempe, Chandler, Gilbert, Scottsdale, as well as throughout the state of Arizona, Nevada, and throughout the world.